The long-rumored Nokia Eos, said to sport a 41-megapixel camera and a quad-core processor, is on schedule to be released this summer on AT&T, said a new report today. The PureView-packing Nokia Eos (or EOS) was detailed in a report at Windows Phone Central, which claimed to have spoken with numerous sources who have seen the phone themselves. According to the site, the Nokia EOS with PureView will feature 32GB of storage, a 720p OLED display, FM radio, and a yellow polycarbonate body. Don't forget that gorgeous 41-megapixel camera with Xenon flash, which this report said will take two versions of every photo - one at 35MP and one at 5MP for sharing online. The rumored Nokia EOS reportedly carries the internal codename "Elvis," though other than the phone's obvious swagger there's no clear reason for it. 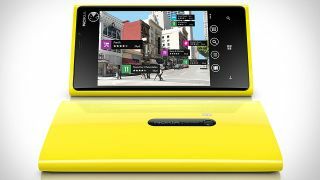 In reality it's most similar to Nokia's 808 PureView; it's essentially a Windows Phone'd version of the 2012 device. It's also about 1 millimeter thinner than the Lumia 920, though with a larger bump in the body for the souped-up PureView camera. Unfortunately, that means no room for an SD card, according to the WPC's sources. The Nokia Eos "Elvis" is also said to feature Nokia's new Nokia Pro Camera app with manual focus and other fun photography functions, plus a "flip-to-silence" feature that lets you send incoming calls to voicemail by flipping the phone upside-down. WPCentral said from what they've seen a July launch makes sense, lining up nicely with what we've previously heard as well. Finally, it added that AT&T won't be the only carrier to get it, though it will likely be the first. Photography isn't Windows Phone 8's only strength. Check out TechRadar's list of the top WP8 apps.